This picture can be seen as a cube in three dimensions. Observe the perspective for a few minutes, without making any particular effort of will. Focus on the center of the cube without moving your eyes. Is the perspective constant? Do you perceive each position of the cube for the same length of time? 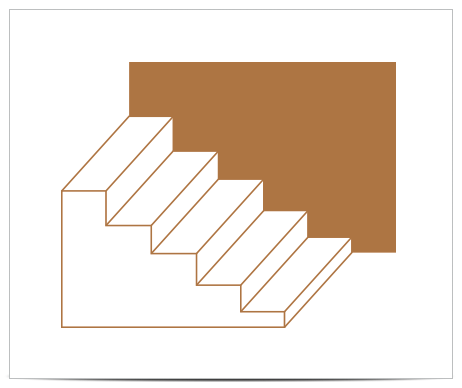 Vertical alternation: This flight of stairs has a peculiar characteristic. It can be perceived as being upside down. This symmetry shows that the brain analyses shapes beyond what we believe we see. This drawing can be perceived in a different way: in the shape of a ‟folding screen” seen from above and dividing a room in two. Whatever the shape of the drawing, some people see parts of it disappear and reappear regularly. All these phenomena show that the two hemispheres of the brain function in a rhythmic fashion. Attention, memory and reflection depend on the regularity of brain alternation. The alternation regular? If so, congratulations! The exchanges between your two hemispheres are regular, your attention is adequate. If not, you probably have problems keeping your attention focused on a task and you get tired quickly. Practicing Phosphenic Mixing exercises will restore your brain alternation and will improve your mental abilities. (Chromos n° 2: ‟The effects of Phosphenic Mixing” can be downloaded for free on this site in Newsletters). 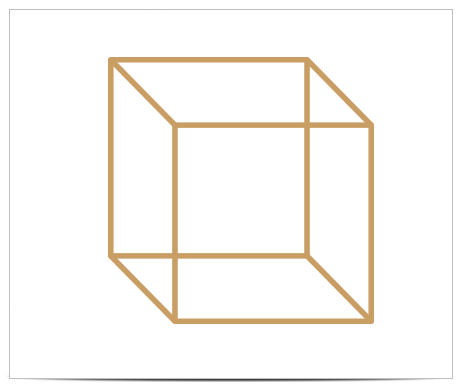 If you observe the cube, you will notice that, after a while, the perspective seems to change spontaneously, as if the cube moved. This phenomenon is usually qualified as an optical illusion, but it is actually a type of analysis that is specific of the brain. The fluctuation is due to the two brain hemispheres functioning in alternation, as demonstrated by Dr. Lefebure in his book ‟Exploring the Brain with the study of the Oscillations of the Double Phosphenes”. These little observation tests underscore the rhythmic functions of the brain. If you did not see the cube changing position, or if the alternation was very slow or irregular, it could signal a cerebral imbalance. 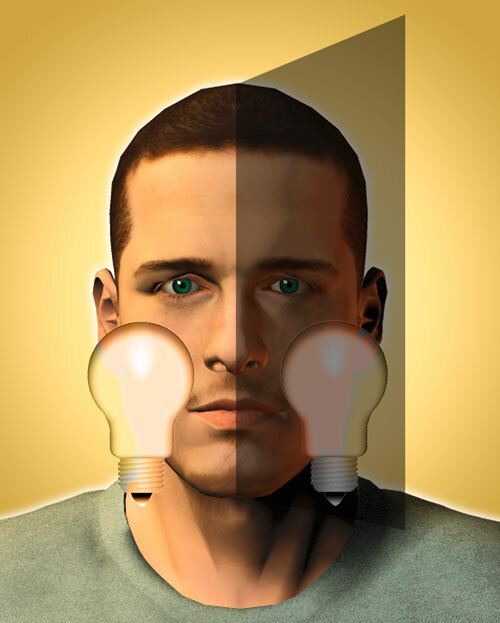 Practicing phosphenic techniques restores the balance of the hemispheres and leads to an improvement of intellectual capacities as a whole. When we associate the phosphenes with any traditional or modern exercises of individual development, we multiply their effects considerably. This way, we can obtain the development of memory, attention, intelligence, the sense of initiative and creativity; making Phosphenism a magnificent educational tool. Phosphenes act as genuine accelerators of the mental processes. They allow us to have a direct action on our own thoughts, on their contents, their quality, their organization, thus optimizing the output of the thinking process or any other intellectual effort. Phosphenes are at the origin of all of Doctor Lefebure’s discoveries. Dr Lefebure’s main discoveries have been verified by the C.N.R.S. at the P.T.T.’s central laboratory. Dr Lefebure received several gold medals as well as the PRIZE OF THE ‟LÉPINE” CONTEST.